Posted 10/25. On Wednesday, 10/07, I had MRIs of my brain and spine. 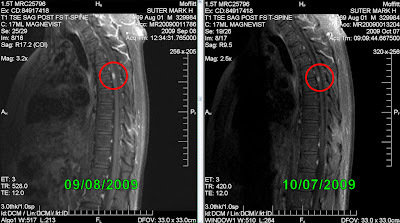 It showed that the avastin (the drug meant to decrease my blood vessel growth) did cause my spinal tumor to decrease in size. Posted 10/24. On Monday, 10/5, I received my 2.6th dose of methotrexate intrathecal chemotherapy. There was not a problem with it. Posted 10/24. On Thursday,10/01/09 I receive intrathecal dose 2.5. The drug delivery went fine. Posted 10/24. Tuesday, 9/29/09, I received my chemo dose #2.4, and my drug dose #2 to prevent blood vessel growth. There was no problem with either. Posted 10/23. On 9/21, I was running a temperature. Laura took me to a clinic, and their test indicated that it was not the flu. The next day, my PCP gave me a prescription to an antibiotic. The antibiotic was a 5 day supply. That 5 day supply somehow made my temperature come down to normal. I don't why because I was taking antibiotics, not antivirals. Anyhow, by the time my normal inthrathecal chemo and drug administration the following week, on 9/29, I was deemed ready to receive it. Posted 10/22/09. Laura and I have been dating an embarassingly long time, which I'm sure I prolonged. I'm sure she wanted to make our relationship official a long time ago. Our first date was 05/11/96. Wow! Yeah, being the photo person, I do have a photo of it. So, I have no car and I do not to go to any stores to avoid exposing myself to swine flu, of which I'm a member of the "do not expose yourself group." 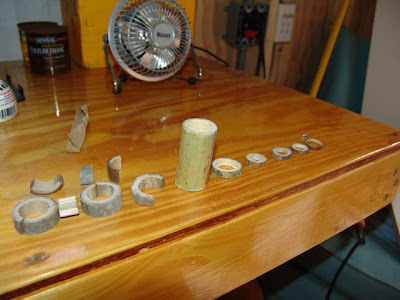 So, I set out to make a ring. There's an abandoned house down the street from myself where I "borrowed" some pieces of bamboo. Oh, I almost forgot the crystal. It was one of Big Monkey's earrings. (We replaced them after I gave her the ring.) It worked very well! 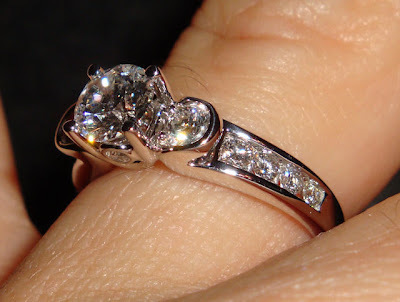 We went down to the Crystal Beach pier, and she accepted the ring. It was a total surprise, accept I had asked for her parents' permission.